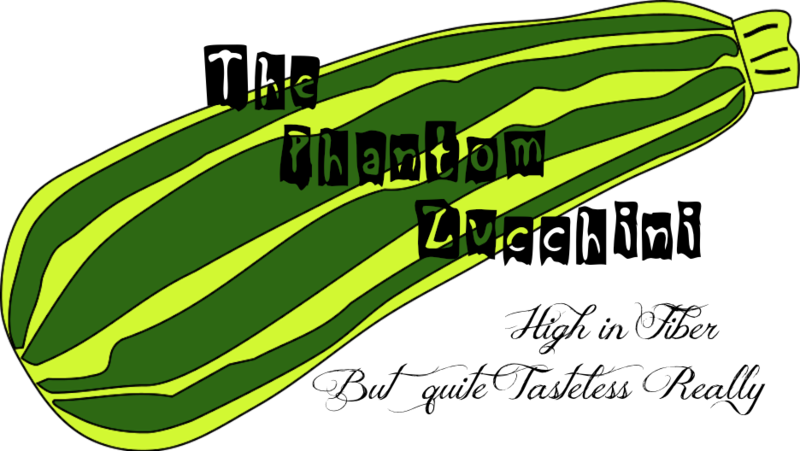 The Phantom Zucchini: How Can A Guy Resist Anything That Claims to Never Lose Suction? 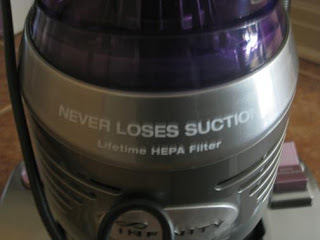 How Can A Guy Resist Anything That Claims to Never Lose Suction? So I got my vacuum. The redesign includes a nice sleeper sofa and one of those low coffee tables that I just so happened to see at Ikea for like $100.00 - so there you go - according to Janine's Justification for Spending Money Using the "I just saved you $200 on this coffee table" method - the price for the sofa now reflects even further reductions. Authors Note: Dave should be advised that according to my calculations soon the sleeper sofa will actually not only be FREE but will also manage to continually save us money somehow. Anyway, the point is that while the decision on which vac not to buy was easy, the decision on which vac to purchase wasn't so easy. Until I saw this one. It wasn't the vacuum so much, it was the name of the vacuum. It's called Infinity. kid 1 - I love David Cassidy. kid 2 - I do too. kid 1 - I love him times 10.
kid 1 - 1,000,000 and so on..... Until one kid said "Infinity." And that was that. There is no topping infinity, people - this is something I have come to know from the time I was a wee lassie who never seemed to understand that all you had to do is say you love David Cassidy "infinity" right off the bat and you win without going through all of that nonsense. However, I am older and wiser now and I still can't believe I thought David Cassidy was even remotely worth bidding infinity over, and more importantly? I have learned that it's best to pull the Infinity Card right at the get-go. So there you go. Author's Note: Actually I just had one of those "competitions" with my sister-in-law recently. It was one of your typical conversations in which one woman tells the other woman that she'd like to kick a third woman in the crotch. She said that. And of course I said I was going to kick her in the crotch twice and then Sue immediately pulled the infinity card. She said she'd kick in the crotch infinity, which of course would hurt like hell, but more importantly? I knew right there and then that I was marrying into the right family. Besides the Infinity vacuum has this. 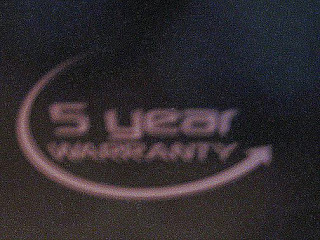 Yeah, that would be a 5 (FIVE) year warranty. And I am all about filling out that warranty card my friends, because I am going to get five years out of this sucker. ha ha sucker that's so funny I kill me. To which I said nothing but merely pointed at this. One time my second husband was the one to break the vacuum first and so I was all waiting for him to replace it. It just so happened that this incident happened rather close to my birthday and one day he was all I think I know what I'm getting you for your birthday and I said That's good it just better not be a vacuum, and I didn't even have to mention what would happen if it was a vacuum that's how even more incredibly scary I am even when I've got my sweet innocent kind of sing songy voice on. Yeah, I got a new vac the next day and a birthday present too because sometimes these vacs can appear to be broken but then suddenly work like a hot damn in the middle of the night when they are aimed at naked sexual body parts. It's an amazing phenomenon that both startles and amazes and kind of horrifies if the demonstration is performed properly. Yeah, Dave should so read this blog more because I am so faking everything with him he would feel so much closer to me. Like Hell I said, "Happy Birthday"!! I was actually going to say "Happy Wedding Gift!" Surely you (and Dave) have seen this? 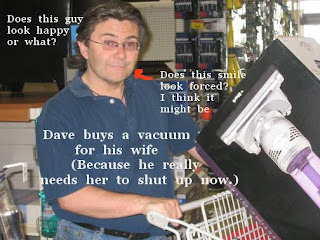 I sent it to Chris, who STILL gave me a vacuum for my birthday. I love it!! The post to this title gave me a belly laugh this morning. I lied to Oldest Daughter when she asked me what I was laughing at!! I knew by the title what you were talking about!! My kids still say infinity!! Happy Birthday and many, many more times infinity!! Dave, first of all, I take notes in my blackberry in the notepad under "blog ideas." It says and I quote "Dave gave me a vac and said Happy Birthday. I'm so going to hurt him in the privates when he's sleeping." And you see, nothing would have changed if you said Happy Wedding Gift accept I would have substituted Happy Birthday with Happy Wedding Gift - but I would have still planned to hurt you in the privates.... infinity. Susan - I had not seen that before! That rocks! Green Eyed - Thanks but it's not my birthday - that's only one problem with this whole scenario. 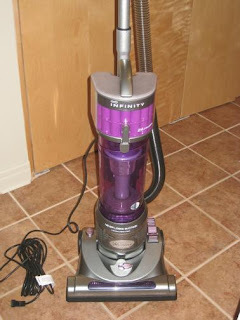 I will keep you posted about the whole infinity thing in regards to this vacuum. I already sent in the warranty card mainly because let's face it - 5 years isn't infinity, however it's longer than I've managed to get out of any vac I've had in the last few years. Infinity . . . what a beautiful name. At least he didn't give you a broken electronic can opener.